If you’re reading this sales letter then you have events you need to promote. You’re either an entrepreneur whose income relies on promoting your workshops, seminars and retreats or you’re a society, non-profit or community group that advances its mission using parties, conferences, gatherings, summits or festivals. Either way, you need to get people out to your events. So I wrote an eBook for you called The Art of the Full House. It’s been twenty years in the making. So, who am I to say anything about this all? Frankly, if there’s any area in which I feel qualified in the world of marketing, it’s this. Ever since High School, I’ve been putting on and promoting events. Since 1995, I have had a direct hand in promoting well over 400 events that have reach thousands of people both locally and from all over the world. This wasn’t something I realized until a few years ago when I looked back and saw that through so much of my life I’ve been involved in the hustle of promoting events. In High School it began with my becoming Student Council president, running pep rallies and doing our best to hype up school dances so that people would actually come. In Grade 10, I got involved in a sketch comedy troupe called Gordon’s Big Bald Head and we’d hustle to get people to our Fringe Festival shows. When I graduated from High School, I started a business called The School Revolution. I led day-long, leadership workshops around Alberta for members of high school student councils that were all about how to increase the school spirit in their schools. I ended up leading 80 of them. Doing these I learned about writing good sales letters, offering upsells and downsells, how to talk to potential customers on the phone, and how to promote events. Then I moved to Santa Cruz, California in 1995 where I worked with a non-profit and helped them promote their youth environmental and social justice oriented summer camps all around North America. In 1999, I founded the Jams program with yesworld.org, which brought together leading young changemakers from all around the world to gather in groups of about 25 for a week. This taught me a tonne about how to reach and fill events with people who are already in high demand. Somewhere around 2001, I began my business Marketing for Hippies and began to learn how hard it was to promote workshops. But, in doing this, I learned a tonne about touring and taking workshops on the road. I learned a lot about what it took to actually fill rooms and about how crucial it was to identify and court the support of local hubs and influencers. It also showed me the power of hosting parties for clients, potential clients and local influencers as a way to grow my business. I had up to 70 local movers and shakers at some of my parties. In 2007, I realized that all of my favourite people, somehow, didn’t know each other. And so I invited them all together for a potluck at my place. It went so well that I’ve been doing them once per month since. These days, my potlucks have between 40 and 50 people in attendance. This has taught me a lot about how to curate a crowd and how to use judicious texting and handbilling to promote events. In 2010 or so, I co-founded Green Drinks in Edmonton. It was a monthly event bringing together progressive, forward thinking, local loving, sustainability-minded Edmontonians. This taught me about how to promote regular social events that aren’t workshops. My friend Hannah and I packed the house with 150 people month after month, selling out those events. Some months were up and some were down. Doing these nights showed me the importance of building up your email list and having niched themes for ongoing events. Doing Green Drinks gave me the idea to found Indigo Drinks in 2012, a monthly mixer for folks in the holistic scene where I was able to apply the same practices to get monthly events of 60 to 80 people at a local elixir bar. In the summer of 2012, I started up a secret project you had to be on my text list to hear about – StreetcarShows.com. The idea was simple: I would rent out a 100 year old, wooden streetcar (with a capacity of 32) and host a local musician to play on it at sunset while it was parked on the 100 year old High Level Bridge over the Edmonton river valley. I sold out ten shows the first summer, fifteen shows the next summer and then passed the project onto a friend of mine who did 18 the summer following and twenty in the summer of 2015. Doing this taught me about the power of a cool and unusual venue as well as the power of making events secret. Also in the summer of 2012, I co-founded The Good 100 Experiment with my friend Nadine Riopel which was an annual community building event for local leaders and change makers in Edmonton. I applied everything I’d learned from the Jams and Green Drinks and led four events with an average of 70 local heavy-hitters at each. On top of all of that, the past twenty years has seen me consulting with dozens of others directly on how to get full houses at their events, sharing notes with colleagues on their best practices and attending hundreds of events and taking notes on what they were doing that worked and didn’t work. 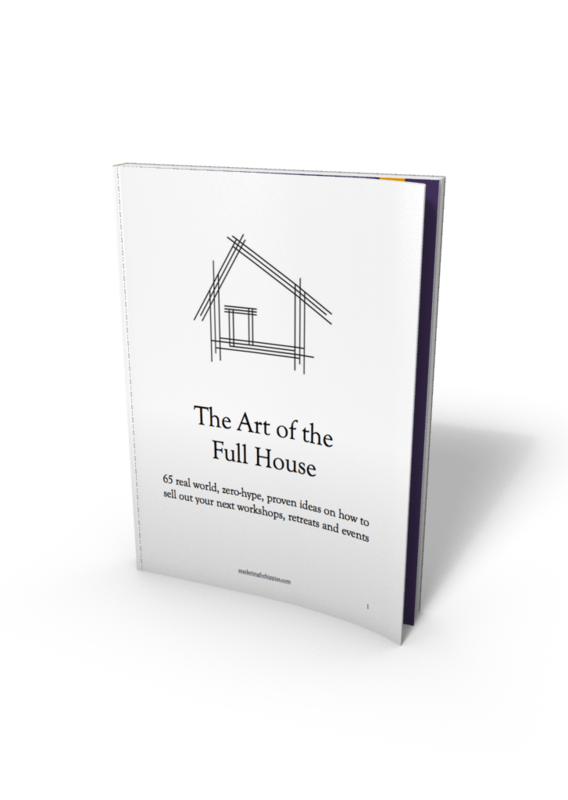 All of that experience has been poured into my 216 page ebook, The Art of the Full House. I thought it might be useful to you to understand a bit of where I’m coming from in my orientation to promoting events and give you a sense of some of the content. My take on filling events is that . . . It takes a tremendous amount of well-placed hustle to sell out events. Most people either lack this hustle or misplace it. The most important element is to focus on the event and to make it as compelling as possible. To many people come to me asking, “How do I hype up my incredibly generic event? How do I get people to come to my lame party?” and they miss the reality that the nature, focus and setup of the event is actually most of the marketing. If you’ve got no niche, then you likely don’t have much of an event either and that means that all of the hype in the world won’t help you (and, if it does, it will hurt you immensely when people realize they were lied to). It’s all about building relationships and a solid reputation with the right people so that word-of-mouth drives your events. You want to make it as easy as possible for people to spread the word about your event. One of the main reasons people go to events is because of who else will be there. It’s much better to start small, sell out and expand than to try to start big and fail. Most people don’t give themselves enough time to plan an event. You should never put on an event you don’t have a plan to sell out. The more you sell out your events, the easier it is to sell our your events. Most people keep creating new events when they should pick about three events they do and really master those. Behind the scenes stories from my 20 years of putting on events and the details of how I made these projects work. Why creating a promotional calendar is so important. Why you should never rely on passive word of mouth. Why you are probably just marketing to 3% of the marketplace right now. My primary approach to dealing with an event that’s coming up soon and for which you’ve got no plan to fill. How to engage those who’ve already bought tickets in helping you spread the word. The simple tactic most event promoters never use in an organized fashion that makes it ten times more likely that local VIP’s will show up. The most important tool I know of for selling out your weekend workshops. My candid thoughts on how to make the most use of Facebook events (worth the price of the eBook right here). How to use story telling powerfully in your sales materials. The five main reasons why people are coming to your events (most people have the wrong idea about this). Critical, make-or-break thoughts on recurring and regular events. Examples of how to use the power of secrecy to make your events the coolest in town. The power of ‘The Countdown” for taking your event from mostly full to turning people away. The power of “The Thunderclap” is creating buzz for your event. Other ways your events can make money beyond ticket sales. My candid thoughts on No Shows at your events (and how to deal). What to do the day before and the day after your event to maximize your marketing. PLUS: an actual email sequence I used in promoting a guest speaker coming to Edmonton. PLUS: the step by step systems we have used to make our Edmonton Green Drinks events such a success. PLUS: a lot more . . .
You or your organization rely on live events for income. You’ve got a workshop, gathering or other kind of event you’re wanting to sell out and you’ve got hustle. You’ve got a clear sense of your niche. This ebook is written with the assumption that you have a clear niche. If you’re not sure, try posting a brief write up of your niche on Facebook and ask people to give you candid feedback on whether or not it’s clear. Have them rate it a 10 if it’s perfectly clear and a 1 if they have no idea what you’re talking about. If you don’t get a 7 or above, then you might need help with your niche more than with selling out your events at this point. You’re on social media and relatively savvy on how to use it (or willing to learn). This eBook is not a complete solution to marketing your events. This ebook isn’t about “how to put on a good event” or “throw a good party.” It will give you some guidance on how to do that but that is a separate conversation worthy of its own eBook. This isn’t an eBook on the logistics of how to organize and run and event. This isn’t an eBook on how to monetize your events to make you the most money possible or how to sell from the front of the room. This is an eBook about how to sell out your events, get butts in seats and have a line up at the door. This eBook isn’t going to give you a proven plan to fill up your event. Those don’t exist. Core to my message here is that, yes, you need to systematize your events but that those systems will be particular to your events. No one can create those systems for you. Will you get some general ideas of what to add to those checklists that you might never have considered? Yes. Will you get a rough sense of timing on those things? Sure. But, in the end, the systems to sell out your events need to be created by you. This eBook isn’t about copywriting, social media or marketing education in a general sense. This eBook assumes you have a level of knowledge about these things already or the willingness to learn. If you sold even a few more tickets to your next party as a result of what you learn, you would make your money back. If you’re running a workshop, there’s a good chance that even selling one more ticket would have you earn more than you spent on this product. P.S. If you or your organization rely on live events for income or impact, I hope you’ll take advantage of the experience of the past 20 years of my life. 20 years of on-the -round experience. 20 years of failing and then learning. 20 years of succeeding and taking notes. If you just sold a few more tickets as a result of what you learn in this ebook, you’ll pay for the price of it entirely. Learning how to promote and sell out your workshops, parties and gatherings is one of the most important and stress-reducing skills you can learn. P.P.S. Money Back Guarantee. If you buy this eBook and aren’t happy with it or don’t think it’s offered you at least $40 USD of value please let us know for a no hard feelings guarantee. And I’d be happy to send you a different eBook on the house to see if that one might be a better fit.